Messenger RNA molecules are temporary molecules. They typically last about ten hours in our cells, but this lifespan varies widely between different messages. Some encode proteins with central housekeeping tasks, such as the enzymes of biosynthesis and catabolism, and can last for days in the cytoplasm. Others encode proteins with more time-dependent tasks, such as transcription factors, and last for only minutes before they are destroyed. The amount of a particular messenger RNA is modulated both at the beginning of its life, by controlling the amount that is transcribed from the DNA, and by controlling how fast it is degraded when it is no longer needed. Messenger RNA molecules are protected at both of their ends. The front end is protected by a molecular "cap" composed of an oddly-connected, methylated guanine. The tail end of the strand is protected by a long string of adenine nucleotides. Cells use two different pathways to destroy messenger RNA, which use two different approaches to overcome these protections. Both pathways begin when the polyadenine tail is removed from the end of the messenger RNA, but they have different ways of dealing with the cap. One pathway attacks the cap immediately, using a dedicated enzyme to remove the cap and then using an exoribonuclease to chew the strand away one nucleotide at a time, start to finish. The other pathway leaves the cap until the end. First, exosomes clip away nucleotides from the end of the RNA strand. The exosome, however, has trouble finishing its task and leaves a short RNA strand with the capped guanine still intact. This is where the scavenger decapping enzyme DcpS comes in. It takes short, capped oligonucleotides and breaks off the terminal cap, finishing the job of degradation. DcpS is a dimeric protein complex with several moving parts. Each protein chain folds to form two large domains connected by flexible linkers, which then assemble side-by-side to form an enzyme with two active sites, located in the large grooves between the domains. The N-terminal domain, shown at the top here, grips the neighboring subunit with an extensive domain swapped interaction, gluing the entire complex together. When the protein is not bound to substrates, it forms a symmetrical structure, as first revealed in the structure of the mouse DcpS solved by the PSI Joint Centers for Structural Genomics (PDB entry 1vlr, shown at the top). Structures of DcpS with substrates and with inhibitors have shown that the N-terminal domain rocks back and forth, closing the active site around the substrate on one side, and then opening when the reaction is finished. The first inhibitor structures were recently solved with the help of the PSI Accelerated Technologies Center for Gene to 3D Structure. In these structures, such as PDB entry 3bla shown in the Jmol image below, one active site is closed tightly around an inhibitor molecule, and the other side is trapped in an open, catalytically-incompetent conformation. These inhibitors were found as part of a targetted search for drugs to fight spinal muscular atrophy. This disease is the most common cause of hereditary infant death, and is caused by defects in the SMN1 gene. Surprisingly, there is a second gene, SMN2, that can substitute for the SMN1 gene if it is activated over its normal levels. It was found that these inhibitors activate the SMN2 gene by blocking the action of DcpS, ultimately leading to increased levels of SMN messenger RNA. The DcpS enzyme is a dimer of identical subunits. 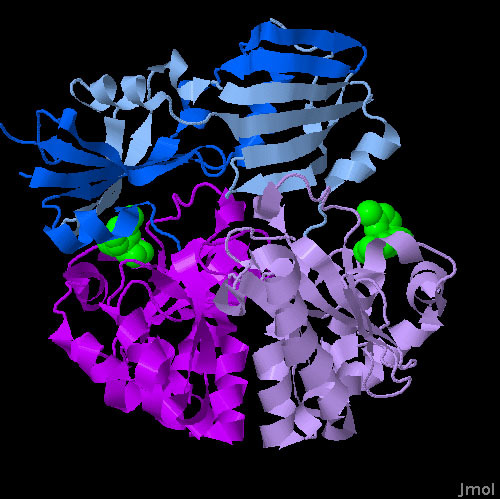 In this Jmol image, the N-terminal domains are colored blue and the C-terminal domains are colored magenta. One subunit is in bright colors and the other is in pastel colors. 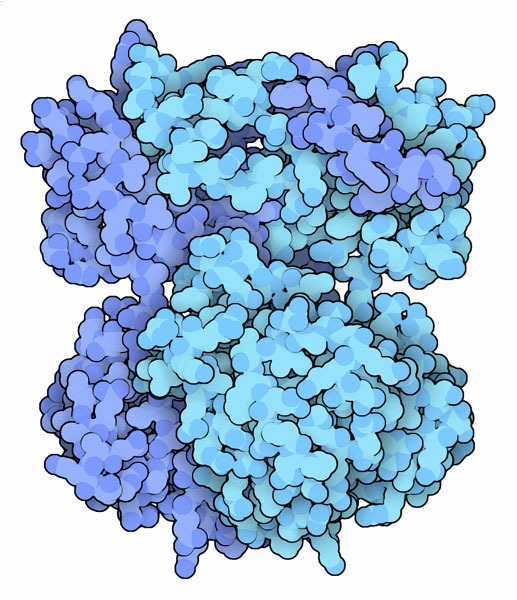 Notice that the N-terminal domain is rocked to one side, binding tightly around one of the bound inhibitors (shown in green). Also notice the large domain-swapped portions in the N-terminal domains. Singh J, Salcius M, Liu SW, Staker BL, Mishra R, Thurmond J, Michaud G, Mattoon DR, Printen J, Christensen J, Bjornsson JM, Pollok BA, Kiledjian M, Stewart L, Jarecki J, Gurney ME. (2008) DcpS as a Therapeutic Target for Spinal Muscular Atrophy. ACS Chemical Biology, epub ahead of print. Han GW, Schwarzenbacher R, McMullan D, Abdubek P, Ambing E, Axelrod H, Biorac T, Canaves JM, Chiu HJ, Dai X, Deacon AM, DiDonato M, Elsliger MA, Godzik A, Grittini C, Grzechnik SK, Hale J, Hampton E, Haugen J, Hornsby M, Jaroszewski L, Klock HE, Koesema E, Kreusch A, Kuhn P, Lesley SA, McPhillips TM, Miller MD, Moy K, Nigoghossian E, Paulsen J, Quijano K, Reyes R, Spraggon G, Stevens RC, van den Bedem H, Velasquez J, Vincent J, White A, Wolf G, Xu Q, Hodgson KO, Wooley J, Wilson IA. (2005) Crystal Structure of an Apo mRNA Decapping Enzyme (DcpS) from Mouse at 1.83 A Resolution. Proteins 60, 797-802. Liu H, Kiledjian M (2006) Decapping the Message: A Beginning or an End. Biochemical Society Transactions 34, 35-38.